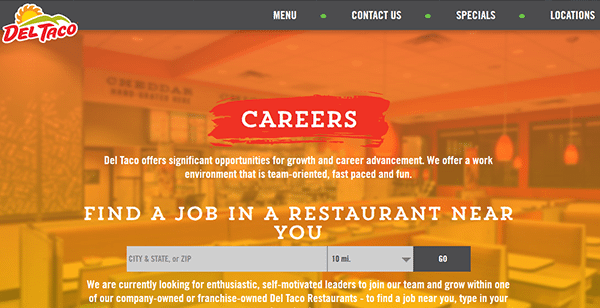 Use the instructions posted below to learn how to access the Del Taco job application (online version). Restaurant as well as corporate positions can be applied for using the online form. It should be noted that certain restaurant locations are owned/operated by independent franchisees (who may have their own hiring process). About the Company: Del Taco is a fast food chain based out of Lake Forest, California. The restaurant specializes in serving American-Mexican style food. The company was founded in 1964 and has over 500 locations throughout the United States. Step 2 – Once you’re on the careers page enter your zip code (or city/state) into the search field and then hit the “Go” button. Step 3 – Scroll down the page and click the “Browse Openings” button next to the location that you want to apply to. Step 4 – Click the “Get Started” button. Step 5 – Check the boxes of the jobs that you want to submit an application for, and then press the “next” button. Step 7 – Select your country. Step 9 – Enter your weekly availability details (hours, available start date, etc. ).